Pot of sunshine from my new Global Solar Oven! 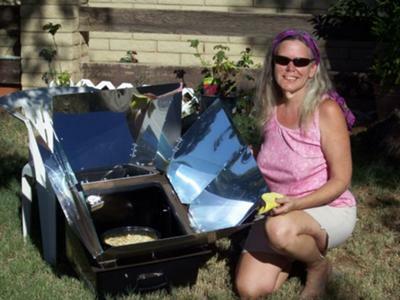 I was so excited to win the August/September contest that I could barely wait to get hold of my new Global Sun Oven. It was like Christmas in September when the box arrived. Unfortunately it came during one of our rather rare overcast times, but during a break in the clouds I was able to heat up the oven and clean it before first use as per the instructions. Being that chicken and rice cooked on my windshield shade solar cooker is a big hit with the family, I decided it would be perfect for the Global Solar Oven's "maiden voyage". The oven was set up at around 12:30 and reached 300 degrees within about 20 minutes. I put the dish in the oven, aimed the oven at the sun (the adjusting leg on the back is BRILLIANT!) and readjusted the position every hour. The temperature never exceeded 300, but this was ideal for the dish. I had to stir the dish after about two hours, and an hour afterward it was done. It was excellent! 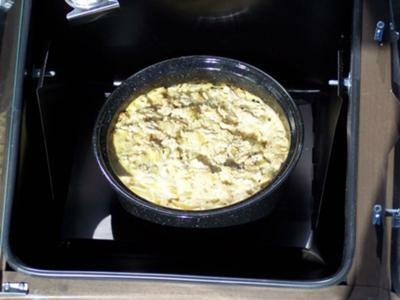 The oven sets up much quicker than the windshield screen solar cooker and is a lot more stable. I am envisioning some mighty nice picnics with freshly cooked meals in the future! I tweaked our traditional recipe a bit as I had ground chicken instead of the chicken pieces I usually use, and was very pleased at how it came out. Brown the chicken and onion just until the chicken crumbles into small pieces. Place in a 3 quart pan with rest of the ingredients and stir. My oven hovered between 275-300 degrees. After two hours I stirred the ingredients then allowed to bake for another hour. The rice turns out very soft, almost like a rice pudding. Thank you Charlotte for sharing this. I am glad you are enjoying your New Sun Oven. It sounds like it cooked your recipe at just the right temperature for that kind of dish. Enjoy your solar cooker and do let others know of our future contest.